Jim 'N Nick's Bar-B-Q: Southern Kitchen, 13840 Steele Creek Road. 704-930-2290. Hours: Sunday through Thursday 10:30 a.m. until 9:30 p.m.; Friday and Saturday 10:30 a.m. until 10:30 p.m. Drive-through. All major credit cards. www.jimnnicks.com. Some say the reason Charlotte doesn't have better bagels is the water. Those are the same people, though, who dump a Heinz sauce on meat and call it barbecue. Barbecue is the defining food of the South -- its soul. Aficionados will tell you that the flavor is in the meat, not the sauce. While many argue about the winning attributes of one style of barbecue or another, what is true is people favor the barbecue of their youth, their food touchstone. Some though, and I count myself among them, enjoy the varying flavors of barbecue throughout the South, whether smoky ribs at Interstate in Memphis or chopped pork sandwiches at a Boy Scout fundraiser in Charlotte. Declaring the "best" in barbecue is like choosing the best child. Maybe it's wildly apparent in some families, but not in mine. As geography varies and reveals its unique beauty, so does barbecue. Alabama is riddled with barbecue legends, like Dreamland Bar-B-Q (now franchised), the now-closed Old Plantation House barbecue (which had a framed genealogical chart that traced Jesus back to Adam and Eve), Golden Rule (which opened in 1891 -- that's right, this eatery has been around for a long while) and Ollie's (which closed in 1999 after nearly 73 years), all of which are or were located in Birmingham. Alabama stands as the gateway to Western barbecue. Typically hickory wood is used, but sometimes it's a mix of pecan and hickory. 'Bama barbecue is sliced or pulled, not chopped, with slaw as a side. Beef barbecue is common, and a thicker, spicier sauce has a vinegar base with tomatoes. The first names Jim and Nick are rarely associated with a barbecue joint. That's reserved for Bubba, Bob, Bud and Ernie in these parts of the South. But father and son Jim and Nick Pihakis opened Jim 'N Nick's Bar-B-Q in Birmingham in 1985. Today, the corporation has locations in seven states, each location with a managing partner. 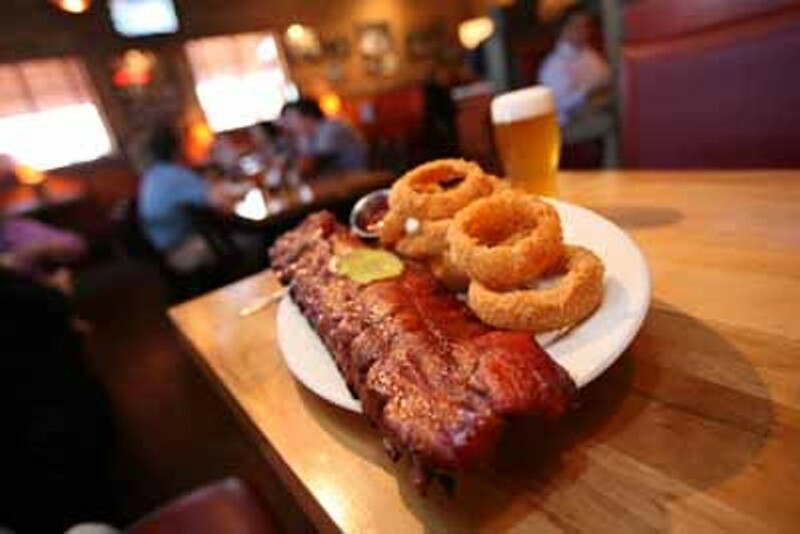 In June 2008, Jim 'N Nick's Bar-B-Q and Southern Food opened west of I-485 near South Tryon Street in a free-standing structure with an unexpected drive-through. Smoke surrounds the entrance and immediately sweeps you into a cozy, pumped-up modern interior, almost a synthetic landscape, infinitely better than the ramshackled barbecue joints in the photos lining the brick walls. Even from an elevated booth, though, the observation of the open kitchen is somewhat hampered, but multiple TVs are visible throughout the room. A clutch of barbecue sauces on each table indicate a "we aim to please" approach. Long center tables are filled with families and happy-faced toddlers concentrating on two-fisted feeding. The wait staff is remarkably fit and informed, yet informal. Almost as soon as the menus are delivered, hot-from-the-oven cheese muffins arrive -- even if they are called biscuits. These are inhaled; more are delivered. The menu flits from barbecue pork to beef brisket, chicken to inventive salads. The rule of thumb used to be that if a barbecue place sold burgers, watch out. Jim 'N Nick's serves burgers, but they also have catfish, brisket and sausage. Their Boston butts are rubbed and smoked for 12 hours over hickory in brick pits while their chickens spend five hours in the pit. The meat of the barbecue pork sandwich is not heavily imbued with a smokiness that is off-putting to the uninitiated. The meat, which appeared to be sliced, not pulled, produces big, open flavors. The bun, however, was too stiff. That may sound strange, but the best barbecue sandwich is served on minimal bread. Pile on the meat, not the yeast. For heartier appetites, the choices fall to the ribs: spare and baby. The baby back ribs are suitably melting and as tender as the last wave. But the barbecue sauces were not as impressive -- neither sweet, vinegary nor spicy. Even the habañero didn't pack much of a punch. On the winning side are the sides. The colossal yellow onion rings will disappear quickly. Get the whole order, not the half. The delightful house variant of cole slaw gets a fresh jolt with bits of scallion while the cinnamon apple slices have renewed appeal. The mac-and-cheese, on the other hand, needs to be rescued from flavor obscurity. Jim 'N Nick's prides themselves on their house-made pies: lemon, chocolate, pecan and coconut. I was told the pastry shells are made in-house, but they are not flaky nor buttery and taste commercial. Prices range from $8.50 for a pork barbecue sandwich, $9 for beef, with one side, to $21.50 for a whole rack of baby back ribs with two sides. A place vending barbecue as Jim 'N Nick's does could not have opened at a better time, now that comfort is the food of the moment. As the high-rollers and expense accounts have disappeared, a new sense of eating to fill the stomach and the soul has reappeared. Keep up with restaurant openings and closings, menu changes and other news from the food industry by checking out the Food category on our blog The CLog -- www.theclogblog.com.